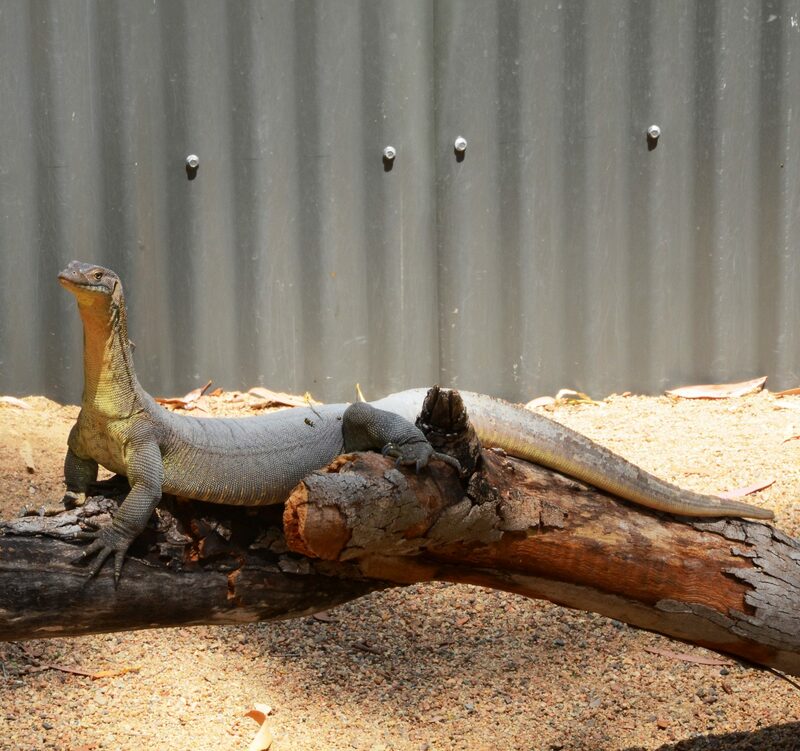 If your travels take you to the northernmost parts of Australia, you may be lucky enough to spot this magnificent monitor lizard basking on a log. The genus name Varanus is the Latin version the Arabic waran, in turn derived from the Semitic waral referring to monitor lizards of the Arabian Peninsula. The species is named after Robert Mertens, a Russian–born herpetologist who worked most of his life in Germany, specializing in the natural history and systematics of lizards. Monitor lizards (from the Latin monere ‘to warn’) are so-called because of the way they raise their heads and upper body in an apparently watchful pose. As you see in the photo, the lizard does appear to be keeping a lookout. At one time Mertens’ was called a ’bulliwallah’ after a station near Belyando in Queensland, where specimens were first collected in 1944. On a background of dark brown or black scales, the upper body has tiny pale yellow or cream-coloured spots. There are bars of dark grey scales along the lower jaw. Scales on the underside of the body are white or yellow, with some greyish banding on the chest. It can reach a total length of a metre or more, with the tail about 1 ½ times as long as the body. Mertens’ water monitors are found in coastal and inland waters across far northern Australia, from Broome to the western side of Cape York peninsula. They’re always near water, where they bask on rocks or overhanging branches, or amongst aquatic plants. These lizards actually dig burrows at the water’s edge, where they shelter at night. They eat pretty much anything they can catch, mainly in the water but also at the water’s edge: fish, frogs, insects and other invertebrates, as well as carrion. They have occasionally been observed foraging for scraps in picnic areas. Mertens’ in Western Australia especially prefer freshwater crabs. When foraging, they move slowly along the stream bed or along land, moving their head from side to side and flicking their tongue in and out. They’ve even been observed to use their body and tail to herd fish into shallower water making them easier to catch! These lizards have an excellent sense of smell, enabling them to locate and dig up eggs of freshwater turtles and freshwater crocodiles. Mating takes place early in the dry season, either in the water or on land. Like all monitor lizards, Mertens’ are egg-layers. Three weeks after mating, the female deposits up to 11 eggs in a burrow filled with leaf litter, then seals up the opening. Incubation takes 9- 10 months, depending on the temperature, culminating in the wet season when food is plentiful. Hatchlings are about 30 cm long, and immediately scramble into the water and start swimming. These lizards are very good swimmers. The tail is flattened laterally with a high, double dorsal keel which acts as both propeller and rudder as the lizard is swimming. The nostrils are located on top of the snout, directed upwards, so that when the lizard is submerged in water, it doesn’t have to stick its whole head out of water to take a breath. As soon as the lizard dives, the nostrils are closed off by a special watertight valve. 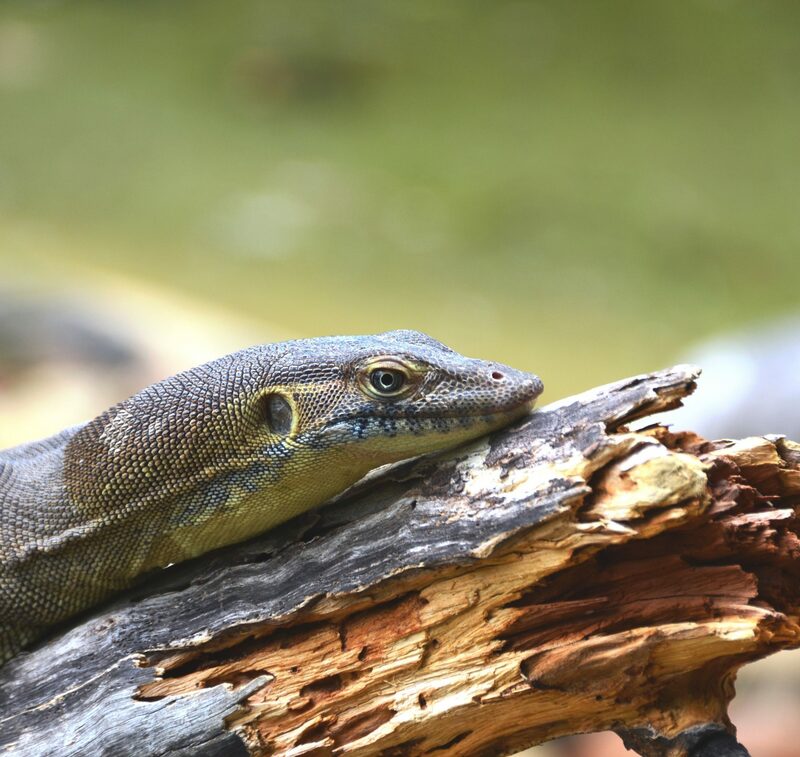 Like all monitor lizards, Mertens’ have a deeply forked tongue which they use, in the same way as a snake does, to detect scents in the air. 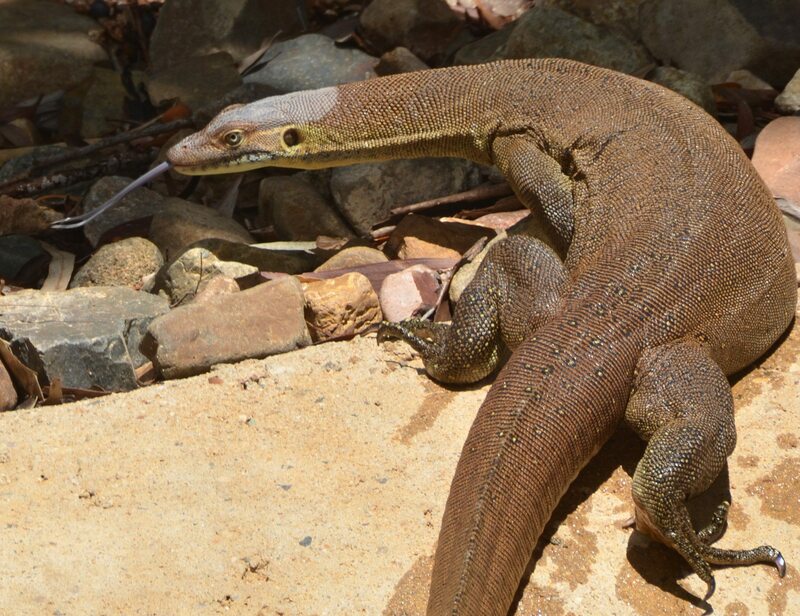 If threatened, Mertens’ monitor inflates its neck in an aggressive display. To escape from predators, it retreats to its burrow, or drops into the water where it can stay submerged for a long time. Introduced cane toads are spreading northwards and westwards throughout the range of Mertens’ water monitors, in large enough numbers to compete for food supplies. They also make easy prey, but their skin contains deadly toxins. 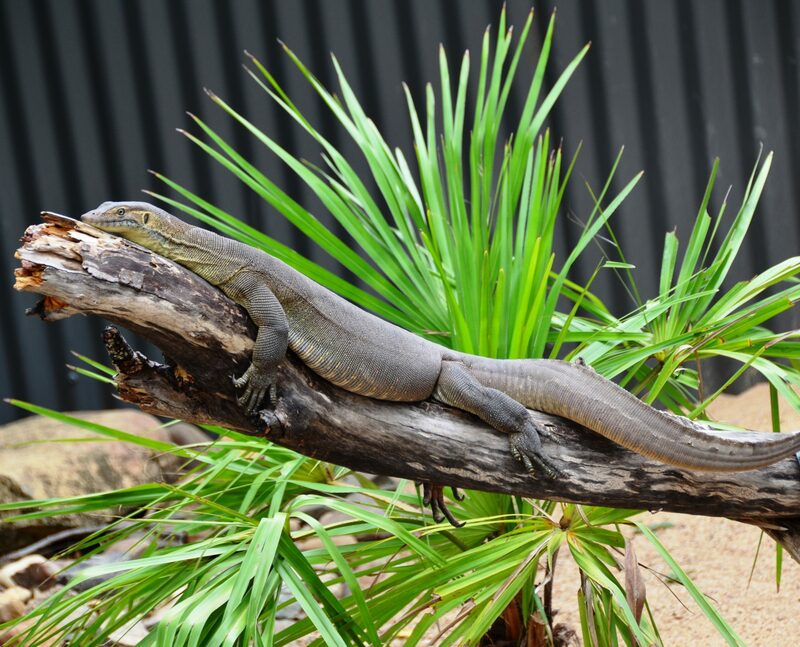 These lizards can easily eat a cane toad which is large enough to kill them. Because of this threat, Mertens’ Water monitors are listed as Vulnerable in the Northern Territory. They are occasionally preyed upon in the wild by freshwater crocodiles and large water pythons.